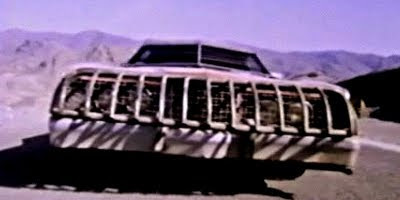 Exterminators of the year 3000 is, pretty much, a direct rip off of Mad Max 2 -The Road Warrior right down to the action beats and bald headed villain from that movie. Robert Iannucci's Alien character seems to be aping the spirit of Mel Gibson, albeit with a dodgy 80's perm and John McEnroe headband. The action doesn't disgrace itself. With enough car chases, explosions and shoot-outs to entertain the post pub crowd on a Friday night. The script,such as it is, is by Dardano Sachetti and Elisa Briganti who must've whipped this up in an afternoon amongst more important projects. Directing duties are credited to Jules Harrison better known as Giuliano Carnimeo who is about as far away from his brilliant Spaghetti western Sartana movies as it could get.